Serving on a school board is a challenging job that requires leadership, vision and dedication. 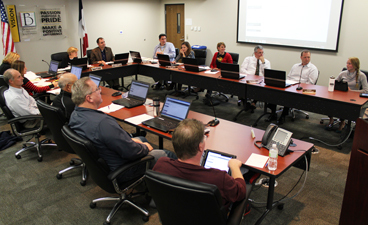 A school board member is entrusted with one of the most important responsibilities that can be assigned to a citizen: ensuring that Iowa schools help students reach high levels of educational achievement. The 1st meeting of the month is a committee of the whole meeting. The 2nd meeting is a regular board meeting. Supports predictable and timely state funding to serve students receiving special education services at a level that reflects the actual cost including educational programming and health care costs. Multiple count dates each year for allocation purposes to assist in additional costs due to increased special education enrollment during the school year. Supports the federal commitment to fund 40 percent of the cost of educating students receiving special education services, and requests that the federal government fulfill that commitment by increasing funding a minimum of 8 percent per year until the 40 percent figure is achieved. Supports the continued development of and funding for research on best practices for improving proficiency in early literacy strategies. Supports continued funding for professional development and classroom intervention strategies focused on implementing best practices for early literacy in grades PK-3. Supports the continuation of programs currently funded by the early intervention block grant program with flexibility to use those funds for other K-3 literacy programs if approved by the school board.